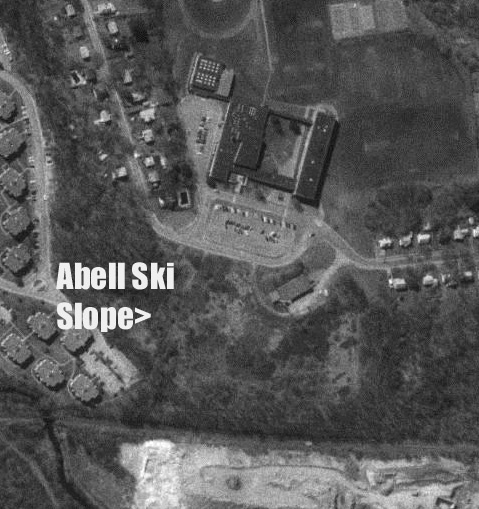 The Abell Ski Slope was a small and relatively brief operation in the middle 1970's, located across the entrance to the East Junior High School in Braintree, MA. Despite its small size, many students learned to ski here. The area closed due to vandalism in 1976. Many thanks to Rick Devin who sent us this excellent writeup of the history of the Abell Ski Slope - his article is below. The small novice ski slope that was located across from the front entrance to East Junior High School in Braintree, MA was first operated during the 1973-74 winter season, under the name “Abell Ski Slope”, with oversight from The Braintree Woman's Club and directed by Jack Devin. In an email received from Bill Hedlund, Director of The Braintree Parks & Recreation Department, Bill says that, “Discussions began in 1972 between Jack Devin, Lucille Barton and others from the Braintree Women's Club about establishing a novice, ski school slope for winter recreational activities for Braintree school children and residents. The first site of choice was a slope near the old 7th & 8th holes at the Braintree Municipal Golf Course on Jefferson Street. However, that did not meet with local approval for skiing, due to a planned parking lot expansion for the golf course.” Therefore, East Junior High School (now called East Middle School) became the next logical ‘town owned’ location for the intended novice slope. In 1973, Charles (Charlie) F. Abell, who was the original Superintendent of Parks for the Town of Braintree, and Jack Devin, a Braintree resident and Blue Hill’s Ski Instructor, began clearing the brush and stones on the hillside to make way for the new ski school slope. 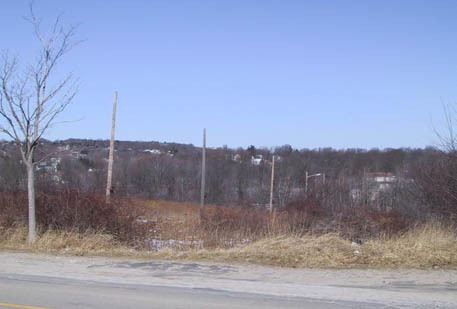 The area was appropriately named “The Abell Ski Slope” in recognition of Charlie Abell’s decades of legendary service to the Town of Braintree. “Skiing lessons under Jack Devin’s direction were first held at “The Abell Ski Slope” during the winter of 1973-1974”, stated Mr. Hedlund. “As the Director of the Ski School”, Jack continues, “I wanted to share and introduce the local residents, my neighbors, to the joys of skiing. Many first time students later went on to ski at Blue Hills and other New England Ski Resorts. My team of Ski Instructors included my brother, Joel Devin, my son, Rick Devin, my friend, Craig Marson, among others - all accomplished skiers and Braintree residents.” Joel & Rick later went on to work at Braintree’s famed “Elm Ski Shop” (owned by Charlie Abell’s son, Ron Abell) and all three Devins each ended up spending several decades within the ski industry. An aerial view of the former Abell Ski Slope, 1995. The East Junior High School, now Middle School is above the ski area. The rope tow was approximately 500' long and had a vertical of 50 feet. Late in the first season, as the snow depths began to wane, classes were sometimes held alongside the school building. East Junior High School had a small, snow-covered, grassy slope with outdoor lighting on the school, which provided limited coverage in the din of the late-winter afternoons. The first winter season of 1973-74 closed with above expected participation and with advance reservations for the upcoming 1974-75 ski school program. Mrs. Barton, of The Braintree Woman’s Club, gave a summation of the first winter program of skiing at this site to The Braintree Parks and Playgrounds Commission in the spring of 1974. There were 75 kids who paid $10 to the Women's Club for 5 skiing lessons received. The goal of the Women's Club, she stated, was to raise sufficient funds to construct a ski tow on that slope. According to Mr. Hedlund, “In the summer of 1974, Tom Flatley constructed a cinder-block building which housed the electric motor and pulleys for the new rope tow installation. 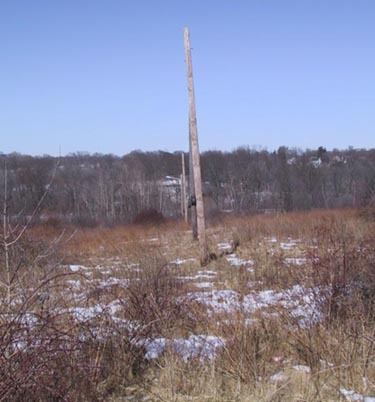 The Braintree Electric Light Department installed the poles and rims used to guide the rope tow from the base of the hill to the building at the top of the hill”. Street lights atop those poles serviced the night skiing option. “The “Abell Ski Slope” with its new rope tow operated for a few more winters”, Bill says, “until vandals damaged the lift controls and set the building on fire - which ultimately led to the conclusion of the winter recreation program at that site.” Since then The Town of Braintree Parks and Recreation Department has offered ski school programs at nearby Blue Hills Ski Area instead. Portions of the cinder-block building, the poles and the guide rims still exist today, as your other contributors have noted and photographed on your website. Like so many other ‘lost’ ski areas around the world, “The Abell Ski Slope” and its’ ski school program - provided hundreds of local school children, housewives and other residents with their very first skiing experience. The excitement of making their first ‘snowplow’ turns, led to ‘stem-christie’ turns and many continued to pursue the sport. And so goes the waxing and waning process of a local ski hill - sharing the enjoyments of the sport of skiing with their local residents and then becoming lost in time to the overgrowth of brush. Thank you “New England Lost Ski Areas Project” for your preservation of all the lost ski areas, so that future generations may come to understand what we did ‘just to slide down the hill’ and to share those joys of skiing with our neighbors. Closeup of the liftline. February 2001 photo by Betsy Brown. Special thanks to the Bill Hedlund, Director of The Braintree Parks & Recreation Department and to Jack Devin, former Ski School Director of “The Abell Ski Slope” for their assistance in compiling this story. Bill has been with the Town of Braintree’s Parks and Recreation Department since 1971 and has devotedly served as its Director for the past three decades. Jack was also a Professional Ski Instructor for the Penny Pitou / Egon Zimmermann Ski School at Blue Hills Ski Area, MA from 1967-1981, Wildcat Mountain Resort, NH from 1981-1987 and Mount Cranmore Resort, NH from 1987-2008. He has earned multiple awards and certifications from the PSIA for his 42 years of service to the sport of skiing. "There was a small rope tow that operated in Braintree, MA by East Junior High School for a few years. The last time I was there the telephone poles with the tire rims were still there." Jake Scott provides more details, though his dates are slightly off: "I remember the ski slope that was next to the East Junior High School. In 1969 a man by the name of Charlie Abell. donated the money to the town to have a rope tow built on a small slope in front of the school. It was very small (300 feet) and the vertical drop was only 75 feet, (strictly a novice hill) but It had lights for night skiing and was free!. The Charlie Abel ski slope was only operated for two seasons due to the fact there was no snowmaking, and in 1973 vandals burned the tow shack. Today all that remains are the tow poles and wheels and as the pictures indicate (below) the area is totally grown in." If you have any photos or memories of this area, please let us know.